I like this album, don't love it. With heavy approval from Brian Foss, owner of garage rock-friendly Seattle venue the Funhouse and host of KEXP's Sonic Reducer, arguably the best punk radio show on the west coast, the Hands appear at first a sure bet. The Olympia group is a quintet of bluesy garage and southern-style punk – dirty rock 'n' roll as it's meant. But the authenticity of this full length debut, recorded last fall, is a bit questionable. It heavily borrows, and nearly any review on the album will mention the inevitable Rolling Stones/Mick Jagger similarity (the latter, for the record, is pretty spot on). But this album is an example of why cheap, rough production works better for some bands than others, and in my case brings to mind a band like Jet, which has the formula down but doesn't sound like more than a watered-down regurgitation of older influences. 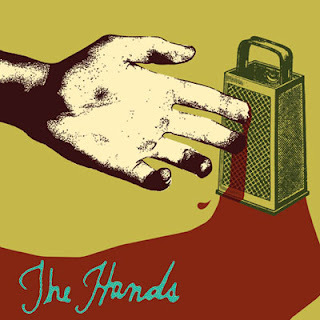 One should expect that the Hands are a thrilling live band, a group that sounds better with every drink in particular. But on record, their lead guitar and production are too clean to pull off a sound of spontaneity; there's adequate variety in the pacing of their songs, but as a complete package the Hands resemble a nameless member of 2002's supposed garage rock craze. Harmonies are a bit on the sloppy side, but sloppiness would be better left to the guitars, which could stand a bit of distortion to mimic the noisy static of speakers in a live setting, where the Hands likely thrive. There's a quality guitar solo on “Lord's Gonna Trouble,” a decent vocal imitation of, yes, Mick Jagger by John Healy (particularly on “Nothing”) and a chord combination which almost adds up to “House of the Rising Sun” (“Wade in the Water”). But outside of a few exciting moments here or there, the record's not raw enough to be praised as a raw record, and though it's admirable to rock in a region dominated by soft-spoken indie poppers, this effort isn't enough to get the Hands beyond the smallest of venues. Why bother reviewing this, then, if it's less than thrilling? Never mind that they'll likely throw this review on their MySpace page to demonstrate why reviewers are irrelevant idiots - it's free press. The Hands are also on a tour to coincide with their album's release, and it's probably safe to say that they deserve a fair shot in a live setting. Check their tour schedule here. This IS why rough production just works for some bands. The Hives should have stayed dirty. No kidding. Agree on the Hives, too, though they at least have the Swede factor working in their favor.